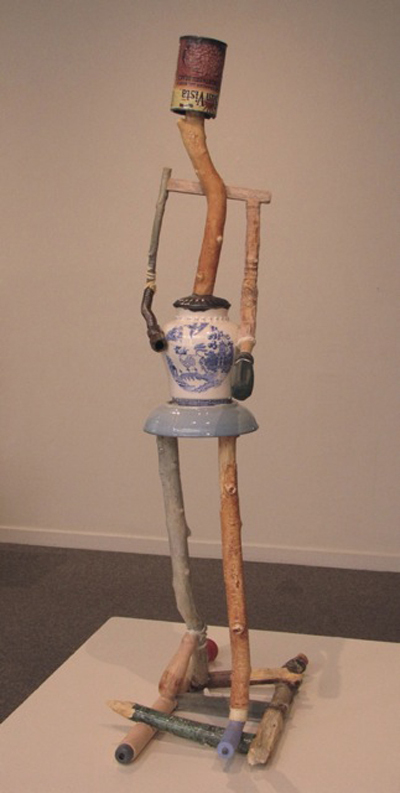 Richard Shaw, ''Willow Ware Lady,'' 2013, porcelain with over glaze decals, 40 3/4 x 10 3/4 x 17 3/4''. Mimesis gets no respect in certain art-world sanctums, where (1) there has been co-optation of art by power elites and, conversely, (2) it's culturally impotent (choose one). Art’s power to represent reality and embody meaning are, of course, not seriously in question, as two exemplary solo shows by ceramicist Richard Shaw and collagist Ken Graves demonstrate. Shaw’s agglomerations of ordinary objects, rendered perfectly in porcelain, are classics of trompe-l’oeil realism, to which Shaw adds his brand of humorous West-Coast surrealism: John Peto meets Giuseppe Arcimboldo. The still-lifes, with their faux work tables, paint-spattered stools, and cigar boxes (with even the labels expertly duplicated with decals) are as illusive as the proverbial painted grapes with which the Greek artist Apelles fooled passing birds. Artists in particular will delight in replicas of familiar art materials that look good enough to grab in pieces like “Midnight Hour (Book Jar)” and “Painter’s Table.” Shaw’s figurative pieces, assortments of sticks, books, bottles, baseballs, musical instruments and the like, appear to have magically come to life (like Mickey’s broomstick bucket brigade). It's all enchanted and enchanting, with“ Willow Ware Lady,” “Seated Lady with Blue Shoe” and “Man on a Pitcher” especially effective to the eyes of this gaping hayseed viewer. Graves’ collages employ printed engravings and photographs in order to subvert reality, in the Dadaist/Surrealist/Beat/psychedelic tradition. The artist creates palpable alternate universes or systems — poetic absurdities that somehow reconcile us to the less satisfying illogic of inhabited reality. To visually inhabit playful and even mordant works like “Her Wish,” “Rock Placement” or “Kite” is to gain a degree of inoculation from the everyday insanities besting us — or at least a brief reprieve. Who are you going to believe: arcane and incomprehensible philosophers (or politicians) or your own eyes and critical sense?